Cinema technology leader Barco is the projector provider of choice for growing southern California-based Galaxy Theatres, providing its Flagship and Smart Laser projectors to outfit all of the exhibitor’s premium large format (PLF) screens in California and Nevada. With a commitment to delivering a first-class cinema experience, Galaxy Theatres brings together the highest quality seating, service and technology to deliver the ultimate moviegoing experience to its guests. A long-time Barco customer, Galaxy made the decision to upgrade its DFX auditoriums with Barco laser projectors, choosing from a wide array of models to achieve the perfect match for every screen. DFX auditoriums will add Barco laser projectors to the existing multichannel, immersive audio system and Galaxy’s famous reclining lounge chairs. The installations are set to be completed by the end of July and early August, and are located at Cannery Luxury+ in North Las Vegas, Green Valley Luxury+ in Henderson, and Legends IMAX Luxury+ in Sparks, Nevada; and Mission Grove Luxury+ in Riverside, Riverbank IMAX Luxury+, and Tulare Luxury+ in California. The North Las Vegas location at Cannery Luxury+ was the first Galaxy Theatres location to install the new Barco laser projectors. This location is the first cinema to feature laser projection in the Las Vegas area. Installation has been completed and Cannery Luxury+ guests are able to experience the new projectors now. Galaxy Theatres, LLC (galaxytheatres.com) is known for providing guests with an exceptional cinema experience with friendly service in a comfortable and customer friendly environment. Its Luxury + theatres all offer the proprietary DFX large format screens, laser projection and Dolby Atmos® as well as their famous reclining lounge chairs. Ranked by size in the top 8% of its industry by the National Theatre Association, Galaxy Theatres is widely regarded as one of the most technologically advanced theatre circuits in America. 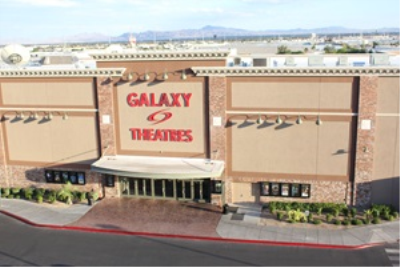 Galaxy Theatres was established in 1998 and is a privately owned, fully integrated movie theatre company.